Community Coffee Mochasippi Sales Up. 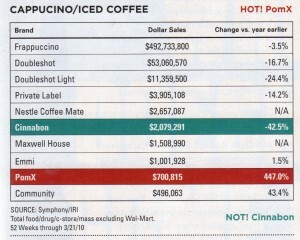 According to Beverage Spectrum’s “Channel Check” for the 52 weeks ending March 21, 2010, Community Coffee’s Mochasippi sales for that period – were up some 43.4 percent over last year. Mochasippi’s sales were approximately $496,063 for the period. At the same time, Frappuccino sales were down 3.5 percent. The brand hit hardest was Cinnabon with a drop of 42.5 percent over the same period. Community Coffee, which has been around almost 100 years, is headquartered in Baton Rouge, Louisiana, and is considered by many to be the official coffee of Louisiana.